A must for all who are interested in the history of Railways in Tasmania or who wish to explore long closed lines. 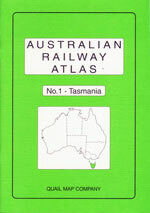 Contains clear annotated maps of the railways in Tasmania including TGR, Prrivate and closed lines on all gauges. Fully annotated and indexed for ease of research.